The background for this chart stems from an April 2004 article stating that Germans led the world in SMS usage in 2003 (See "Germans are world SMS champions"). None of the statistics in the article were correct. For example, the article stated that Germans--who are not even ranked in the top ten by the number of SMS sent per subscriber per month--led the world by sending 200 million SMS a year. 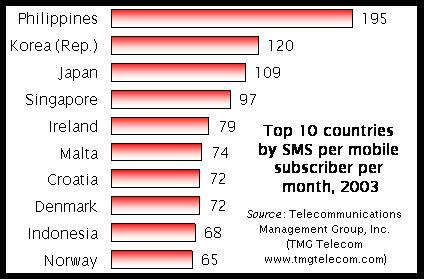 This is less than 1 SMS per subscriber per month and is clearly wrong. The German telecom regulator reported that Germans sent 20 billion SMS in 2003, or some 27 per subscriber per month. This only ranks Germany number 22, far behind the Philippines, where the average mobile subscriber sends some 200 text messages a month ranking that country tops in the world. This rectifies an earlier misunderstanding in the Asia Pacific Mobile Multimedia Outlook report where Singapore had been ranked ahead of the Philippines. This was picked up by one news article Tops in text: Singaporeans edge Pinoys. 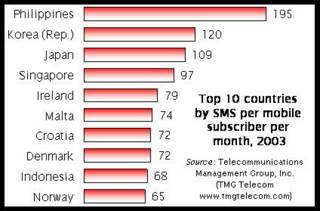 It turns out that the Singaporean data included both SMS sent and received. The data are now correct in the chart to show only sent text messages.